There are few things worse than the feeling of cold toes. At first, your toes start to tingle, and then the tingling turns to pain as your toes turn numb and frostbite begins to set in. While many of us try to fix the problem by wearing extra pairs of socks, it’s not always practical to wear extra layers with tight-fitting shoes or boots. The problem can be avoided altogether by wearing a pair of heated socks. Not only do they stop your feet from getting cold, but they also replace your existing socks and allow you to wear your normal shoes and boots without the feeling of tightness and constriction that wearing multiple layers brings. Heated socks work by placing a heating element under the ball of your foot, above your instep or around the toe areas of the sock. Some of the best socks are made from a merino wool blend and can provide several hours of warmth from a single battery charge. The heating is applied to the top of the foot in the front instep area. The heating isn’t applied to the base of the foot or under the toes. 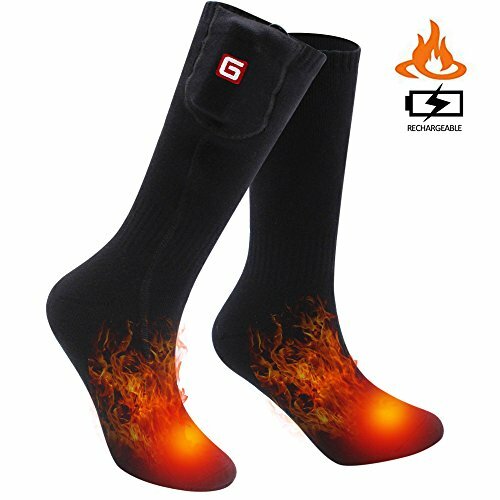 When you first get the Greensha heated socks, you will want to charge the battery for about 10 hours. After they are used for the first time, the recharge time reduces to 6 or 7 hours. With 3 heat settings, most people use them on the low or medium settings to prolong the battery life. The medium setting warms your feet for 5 hours and the high setting lasts about 3 hours. This is plenty of time for a football game or traveling to and from work in the snow and ice. However, if you work long hours outside, a pair of spare batteries will help you get through the entire day and is well worth the extra investment. Our Verdict: A good pair of socks with many satisfied customers on Amazon. Keep in mind that these socks only heat above your instep area and the bottom of your feet and toes may still feel the cold. 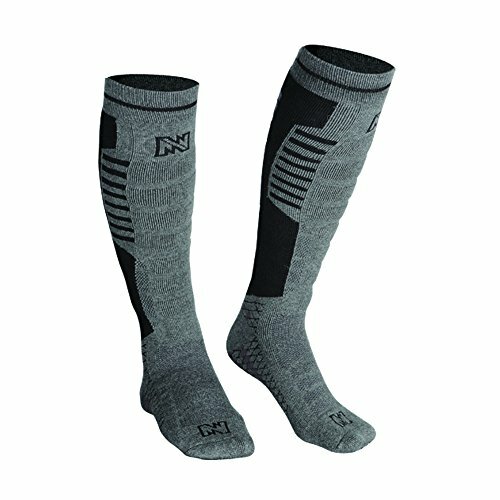 These black and grey spandex and cotton socks fit feet that are up to size 10 and are suitable for most outdoor activities. The 3.7V heating elements are built into the areas above and below the front of the foot. With 3 heat settings, they heat for about 3 hours on the medium setting and 5 hours on low. The high setting is extremely effective and cannot be used continuously without the risk of burning or overheating your feet. When you first get your SVPRO heated socks, you will want to charge them for 10 hours. After they are used for the first time, they charging time reduces to 6 or 7 hours. Even though the packaging explains that the charging light will turn green when the socks are fully charged, we did not find this to be the case. The light stays red and the socks need to be unplugged after 6 or 7 hours as there is no other way to tell when they are fully charged. Our Verdict: On the highest setting these socks produce a huge amount of heat. We recommend that you turn them down to medium or low as soon as you start to feel the heat and to avoid burning the top of your foot. Another pair of socks that are good for most outdoor activities. Perfect for ice skating, fishing, hiking, skiing, hunting etc. The socks are made of Spandex and cotton and include a battery pack with 3 heat settings. 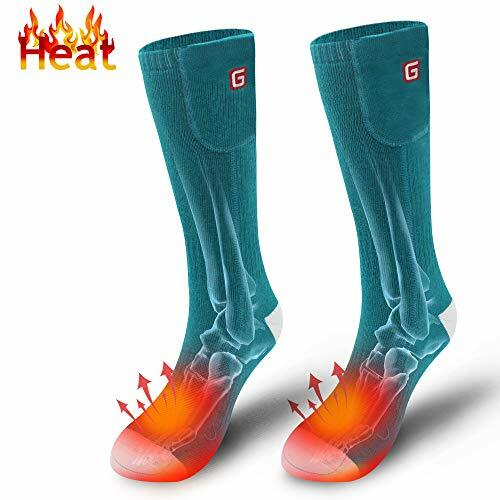 Like many of the other pairs of heated socks, the highest setting is too hot to use continuously and you will want to turn the batteries down as soon as you start to feel the heat. When the batteries are fully charged, they last for 5 hours on medium and 6.5 hours on low. The first charge of the 3.7V batteries takes up to 12 hours, and subsequent charges take between 4 and 5 hours. The battery pack has an LED indicator that turns green when the batteries are fully charged. 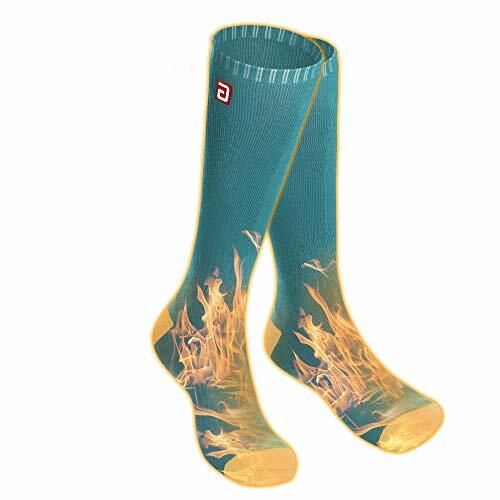 Heat is applied to the top of your foot and radiates to the other part of your feet through the sock lining. Like the other socks, the bottom of your feet and toe area may still feel the cold on the lower settings. Our Verdict: Unless you want to consider the expensive Lenz heated socks, the Global Vasion heated socks are our socks of choice in the low cost range. Not only are they popular on Amazon, but they are a solid performer with consistently good reviews. 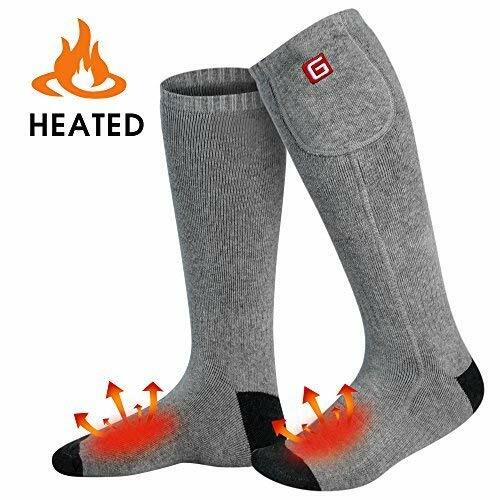 If you want to step up a level you can’t go wrong considering the Mobile Warming heated socks. They have several benefits that you won’t find in lower-priced socks. With a battery life of 11 hours on the low setting, these socks are ideal for a long day away from home. However, based on customer reviews, it appears the 11 hours shown on the product documentation is quite optimistic – and 7 or 8 hours seems more realistic and consistent with the experience of purchasers. When it comes to fitting, the Mobile Warming socks come in two different sizes. The medium fits Men size 4 to 10 and Women size 6 to 11. The large size fits Men size 10 to 14. Our Verdict: Even though these socks cost a bit more than some of the competitiors, we think they are worth the extra cost. 7 or 8 hours of practical heating time and the remote control unit are nice additions that justisfy the extra expense. If you have large feet, you will also appreciate the extra space in the large sock size. Available in Blue, Pink Grey, and Black, these heated socks are made of cotton and spandex. With three power settings and an average heating time of 6 hours on medium, the Autocastle heated socks can keep your feet warm throughout the day. The heating element is located just above the foot in the instep area so you may still feel the cold under your toes and in the heel areas. While this is not a problem when you’re at home, it can be a problem when you are outside hunting or fishing. The heat radiates effectively around your feet on the inside of your shoe or boot and most people seem to be happy with the results. Our Verdict: Like most heated socks in this price range, the heating is only applied to the top of the foot. The battery pack is quite large and can get in the way with tight and tall boots. Keeping your feet warm is bound to be your primary concern, and selecting a pair of socks that can provide constant heat for long periods of time from a single charge is ideal. Most budget socks will provide heating for 5 or 6 hours on medium. As you move up in price, batteries can provide heat for as long as 10 or 11 hours. While none of our reviewed socks are made of Merino wool, the type of fabric you select will have a big impact on how warm your feet will feel. Cotton and Spandex fabrics are stretchy and will fit most feet sizes. They are commonly used in one-size-fits-all designs. More advanced fabrics have antibacterial properties that also wick moisture away from the skin to keep your feet warmer for longer. As your feet heat up, they’ll tend to sweat and the wicking properties will help them stay dry and warm for longer. if you really want the luxury of Merino socks, you may want to consider the Lenz premium range of heated socks. The location of the heating element can make all the difference when it comes to keeping your feet warm. Most people feel the cold in their toes, heels, and top of their feet. By strategically placing heating elements around the foot, gentle warming can be applied to cancel the surrounding cold air. Most socks provide a heating pad above the top of the foot in the instep area. Some of the more expensive products also provide heating elements around the toes and in the heel area. Deciding on a set of heated socks can be a bit hit and miss. When it comes to budget socks, most of the socks are virtually identical with slight differences in heating time and the materials the socks are made out of. If you’re prepared to pay a little bit extra, you get extra features including wireless remote control, better heat control, and antibacterial fabrics that can wick away moisture to keep you dry and warm for longer. If you have the budget, we really recommend the Mobile Warming heated socks. They have a good battery life and the ability to control them using a wireless remote control. If you are looking for a top of the line, premium product, have a look at the Lenz range of heated socks. They have been selected by the Austrian Winter Olympic team and have heating elements around the toe and heel areas. However, they are almost six times the price of the budget socks reviewed above. You can read our dedicated review by clicking here. Do you already have heated socks? What type are they and how well do they perform?